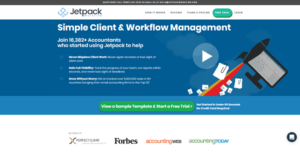 Jetpack Workflow is a practice management and workflow automation software designed to make accountants’ job easier, faster, and more accurate. It is a suite of tools that offers total client management, scheduling, task management, and tracking capabilities in a single, compact, and robust package. With JetPack Workflow, accounting firms will see their productivity increase as nothing slips through the cracks. All opportunities are visible and actionable, allowing them to view and organize their tasks, address top priorities, and track the progress of their projects and clients closely. Gone are the days where tracking billable hours can be a real pain. JetPack Workflow is created to monitor and record all billable hours in seconds. Users don’t have to worry about not getting paid right for their work. JetPack Workflow does it all so they won’t have to. Jetpack Workflow has a Repeat Scheduler feature perfect for managing recurring clients and tasks, eliminating the need of having to create the same job again when you can duplicate it across your clients. This helps in reducing, if not totally addressing, the instances of missing deadlines. Traditional information management requires you to use trusty folders and file cabinets to store and organize all your tasks, client information, and other documents. However, looking for specific information can be quite a task when you can’t locate them quickly. With Jetpack Workflow, you can easily find what all the information you seek in just seconds. No more scouring through mountains of folders and papers or going through cabinets one by one. A quick search and Jetpack Workflow delivers the information you need in mere moments. Accounting is an extensive process. While it can be done a single individual, business accounting requires a team of professionals to get the job done easier and quicker without compromising accuracy. Jetpack Workflow lets you see what your staff is working on, who is assigned to what tasks, and which tasks are more than a handful that needs an extra set of hands. The software helps you and your accounting team work together and get the job done in the most efficient and productive way. It is important to note that almost no service in the Accounting Software category is an ideal solution that can meet all the goals of various company types, sizes and industries. It may be a good idea to read a few Jetpack Workflow reviews first as certain software may dominate only in a very narrow set of applications or be designed with a really specific type of industry in mind. Others may function with an intention of being easy and intuitive and consequently lack advanced functionalities welcomed by more experienced users. You can also come across services that support a broad group of customers and give you a rich feature set, however this in most cases comes at a more expensive price of such a solution. Be certain that you're aware of your requirements so that you buy a service that has exactly the functionalities you search for. How Much Does Jetpack Workflow Cost? We realize that when you make a decision to buy Accounting Software it’s important not only to see how experts evaluate it in their reviews, but also to find out if the real people and companies that buy it are actually satisfied with the product. That’s why we’ve created our behavior-based Customer Satisfaction Algorithm™ that gathers customer reviews, comments and Jetpack Workflow reviews across a wide range of social media sites. The data is then presented in an easy to digest form showing how many people had positive and negative experience with Jetpack Workflow. With that information at hand you should be equipped to make an informed buying decision that you won’t regret. What are Jetpack Workflow pricing details? What integrations are available for Jetpack Workflow? If you need more information about Jetpack Workflow or you simply have a question let us know what you need and we’ll forward your request directly to the vendor.